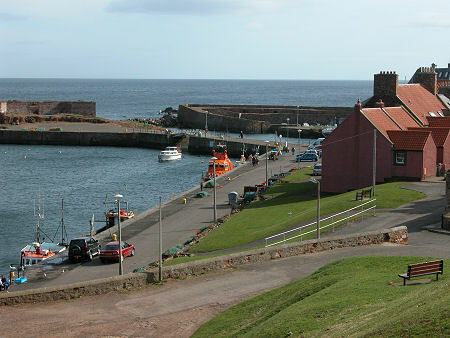 With a natural harbour protected by a large defensible outcrop of rock, Dunbar was an obvious place for early settlement along this north east facing coast. 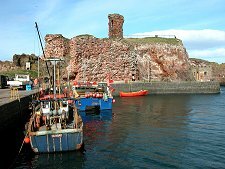 The rock on which the remains of Dunbar Castle now stand has been fortified for the better part of 2,000 years: and there is every chance that Dunbar itself is just as old. But if Dunbar's origins owe much to its castle, so do its later fortunes and misfortunes. The castle was repeatedly besieged from the 1200s to the 1500s, and whether or not the attackers took the castle they usually burned down the town to make the trip worthwhile. Coupled with this, its position as a handy port on the English side of Edinburgh has often made it well worth capturing in its own right. This remained true as recently as September 1650, when Cromwell used it as his supply base prior to his defeat of the Scottish Royalists at the Battle of Dunbar. The main road from Newcastle to Edinburgh has always tended to bypass Dunbar, as the A1 does today. 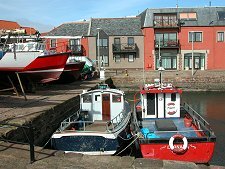 This attractive town has much to offer the passing traveller and makes an excellent first - or last - port of call in Scotland for those travelling to and from England. The focus of today's Dunbar is its High Street. This offers a range of shops. 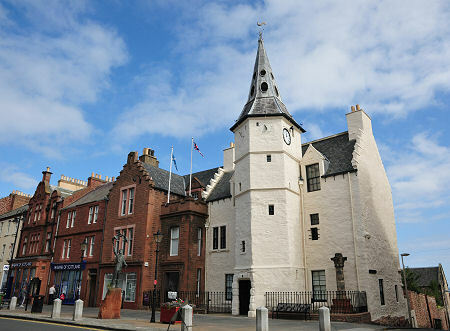 It is also home to the strikingly attractive Town House, now a museum and tourist information centre. Anyone who's not been to Dunbar for a few years might be surprised to find the Town House sporting a coat of cream harling following a major refurbishment. We prefer the old red stone finish, also shown on this page, but the harling presumably protects the stone from the erosion in the sea air. 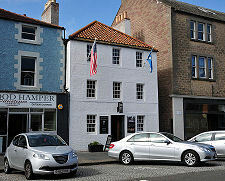 On the opposite side of the High Street is John Muir's Birthplace an excellent museum devoted to the writer and pioneer environmentalist. The north end of the High Street leads directly to Lauderdale House. An unusual building for such an urban setting, it was extended by the Adam brothers for the Earl of Lauderdale before being converted to barracks in 1859, and more recently into flats. Down the hill from this end of the High Street is Dunbar's Victoria Harbour, built in the 1840s and the final death knell for most of the remains of Dunbar Castle. The opposite corner of the harbour is occupied by a fortified artillery battery, while further to the south east again is the Cromwell Harbour. 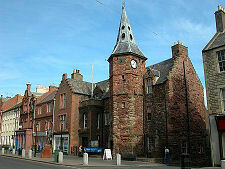 The completion of this in 1730 led to Dunbar's dramatic growth as a fishing and, for a time, whaling port. 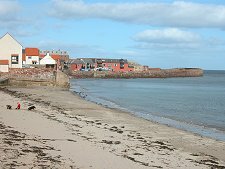 To the south of the Cromwell Harbour is a beach which adds further to Dunbar's range of attractions. Heading inland from the far end of the beach effectively completes a short tour of Dunbar. 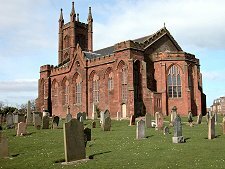 Here you find one of the town's most prominent landmarks, Dunbar Parish Church. This was built in 1821 and beautifully restored in the 1990s, after a serious fire in 1987. Not far from the church is Dunbar's railway station, which lies on the East Coast Main Line from Edinburgh to London. The coastline either side of Dunbar is occupied by golf clubs. 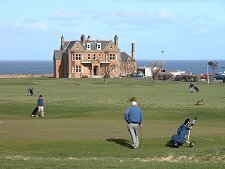 Dunbar Golf Club is the best known, while to the west of Dunbar is Winterfield Golf Club, not as prestigious or as old as Dunbar, but with stunning views across to Bass Rock. Inland from the Winterfield Golf Club is Belhaven, in effect a western extension of Dunbar. 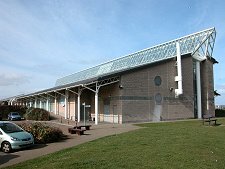 Since 1780 Belhaven has been home to the Belhaven Brewery, which goes from strength to strength and is better known than the settlement from which it took its name. 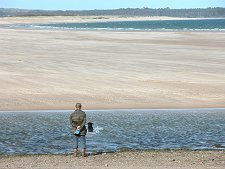 West again are the wide open sands of Belhaven Bay which forms part of the John Muir Country Park, named after Dunbar's most famous son. Born in Dunbar in 1838, John Muir's family emigrated to the USA in 1846 where he went on to found the US National Park system.